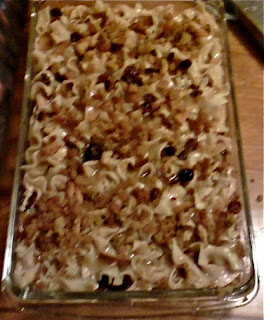 La Petite Gourmess: Thanksgiving Leftovers...Lasagna, Again? I'm not sure if your Thanksgiving leftovers are gone yet -- I didn't have any as we were guests at two separate, wonderful dinners this year--but the idea of Chris's Thanksgiving Lasagna came up again, and we actually made it for my sister/parents last week. We weren't able to stay and sample it, but from what I hear it was pretty good. Take a lightly buttered lasagna/casserole pan and cover the bottom with the leftover stuffing, reserving a few tablespoons for the topping. 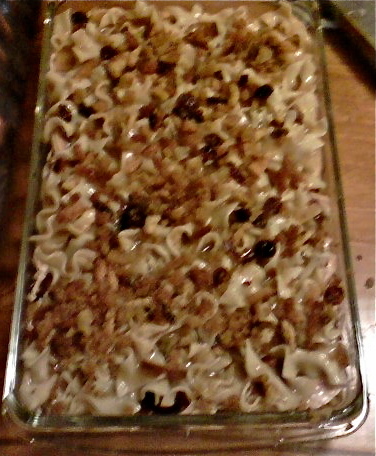 Then, add a layer of shredded turkey breast, a light layer of cranberry sauce, and top with egg noodles and gravy. Sprinkle the extra stuffing on top, add some fresh pepper and wait for all the gravy-goodness to soak into the bottom before heating through and enjoying. You can of course do this with any combination of your leftovers -- mashed potatoes, green beans, sweet potatoes, etc. The sky's the limit. Have fun and let me know if you try this!